Pasta with Smoked Salmon "Acqua al 2"
Anyone who purports to know even a little about fashion knows that the one indispensable item in any woman’s wardrobe is the little black dress. It’s elegant, it’s sophisticated, it’s perfect for any occasion, and most importantly, you don’t have to think about it; you just throw it on and you’re dressed for anything, regardless of which way the fickle winds of fashion happen to be blowing the rest of your attire. Well, believe it or not, I’ve actually survived for thirty years without a little black dress (in truth, I’ve bought several over the years, but none has ever been that black dress), but I do have something in my arsenal I couldn’t survive without. Let’s call it the little black dress of dinner. To me, this edible little black dress represents nothing short of the holy grail of recipes. I mean, let’s face it – as much as I love to cook, sometimes I want to invite people over without having to spend twenty-four hours sweating into a pot of demiglace. I want to make something that’s impressive and unusual, but also foolproof and affordable. I want most of the ingredients to be already sitting in my refrigerator, or at most a fifteen-minute trip to the supermarket away. Heck, I want something that I can start making twenty minutes before my guests walk in the door and still be absolutely certain it will knock their socks into orbit around Pluto. I want something like this salmon pasta. Recipes like this are, unfortunately, all too rare. Most dishes designed to impress are full of complicated techniques, esoteric ingredients and tedious prep work. This one couldn’t be farther from those if it tried. It takes literally twenty minutes from start to finish, pasta boiling time included (well, maybe a couple more if you want to get your onions nice and caramelized), and chances are, you’ve got more than half of the ingredients on hand already. Most importantly, though, it is really, really good. I confirmed that first time I tasted it, ten years ago at the bustling Florentine restaurant Acqua al 2 (which, I see through the miracle of the internet, not only continues to flourish, but now has a sister restaurant in San Diego. Go figure!). Their gimmick was (and still is, it seems) a pasta sampler, a succession of five plates of pasta in every shape and size imaginable, each dressed with one of their legendary sauces: tangy salsa verde, earthy funghi porcini, spicy eggplant and tomato. Actually, I’m just guessing about those, as apart from this dish, I can’t recall a single thing I ate there that night. I only remember, midway through that parade of pasta, being floored by one of the most ridiculously tasty sauces I had ever eaten, atop noodles or not. It was salmony, but not too salmony, slightly sweet, subtly garlicky and thick with cream – I swear, if I had spoken better Italian, I would have asked to kiss the chef’s feet, or at least, would have asked for a bathtub-sized carton of the stuff to take home so I could have spent hours dissecting its components. But I didn’t, so as soon as I got home I tinkered and tinkered until I managed to recreate that pasta, and even now, ten years on, it’s one of my most treasured recipes. Blushing pink and scandalously rich, it somehow manages to straddle that elusive line between sophistication and familiarity, comfort and excitement. I have served it to salmon-lovers, salmon-haters and salmon-ambivalents, and not a single one has ever refused seconds (or thirds, when they’re available). I even sleep better at night knowing this recipe is there, since one of my recurring nightmares involves an Iron-Chef-like scenario of having exactly one hour to whip up dinner for dozens of important people. In that scenario, the food, thanks to this pasta, would be no problem; it’s just too bad I would have to spend the remaining forty minutes trying to decide what on earth to wear. As I’ve said, this is a perfect dish for company, but I also make it sometimes for just the two of us, in which case I cut the quantities in half. You’ll want to use a smoked salmon of reasonably good quality; I find that the ultra-cheap kinds are often unbearably salty and can have some textural issues, but whether it’s been hot or cold smoked doesn’t really make a difference since the salmon ends up cooked anyway (in case you don’t know the difference, cold-smoked usually comes in thin, supple slices and looks quite similar to raw, whereas hot smoked is usually sold in a chunk and has more of a firm, "cooked fish" appearance). Oh, and don’t tell any Italian grandmothers, but I have been known to occasionally gild this lily with some freshly-grated parmigiano reggiano (I know, blasphemy! ), but strictly speaking, it really doesn’t need it. Put a large pot of salted water on to boil. In a large skillet, heat the oil over medium heat and sauté the onion until golden and starting to caramelize, about 10-15 minutes. Add the garlic and sauté just until it loses its raw edge, about one minute more. Pour in the wine and bring to a boil, stirring constantly. Add the cream cheese, stirring until it melts, and then the cream. Bring the mixture to a gentle boil, stirring constantly. Reduce the heat slightly and stir in the tomato paste, sugar and smoked salmon. Cook, stirring frequently, for about 5 more minutes, until the sauce is quite thick. Taste and add salt and/or a little more sugar as needed. Cook the pasta in the boiling salted water until just al dente. Drain the pasta, reserving a little of the pasta water. In a large bowl or the empty pasta pot, toss the pasta with the sauce, adding in a little of the pasta water if needed to help the sauce coat the noodles evenly. This is really similar to something we call the "BC Bowl" up in Whistler. It’s one of my favorites too…mmm…. Love that pasta bowl, btw! I once came home from a fishing trip with large ziploc bags full of wild smoked salmon. Smoked salmon in a cream sauce on home-made fettuccine became a go-to dish, and still remains one of my favorites to this day. your photos always, always make me melt. Yummy! Hmmm I can just smell the heavenly feeling of your pasta. I will admit to being a sucker for salmon in pasta ever since my first taste of it at a hole-in-the-wall (hole-in-the-canal?) in venice. unfortunately, everything that I’ve tried in the US has been too salty to be good–and now I know why, I think :)thanks for the tip–can’t wait to try it myself! 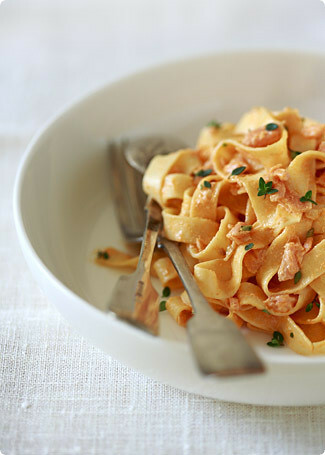 I never would have thought of comparing salmon pasta to the proverbial LBD – but yes, that works. Simple, elegant, seductive … too bad there really isn’t anything analogous to the LBD for us guys, but that might be stretching the analogy too far.I tend to go very plain with my versions of this dish and really highlight the salmon, but that’s just me. I don’t mind a little variety though, so I’m definitely going to keep this version around for the next fresh catch. I like the little black dress introduction. I have a few "little black dinners" myself and something similar to this is on that list. Smoked salmon, zucchini, leeks and goat cheese fetuccini. Everyone loves it around here. Thank you for another lovely post! Hi there…I just discovered your blog through Tastespotting. Your photos and stories are wonderful. The salmon pasta looks so great that I really wish smoked salmon weren’t so hard to find in Beijing! Looks very appetizing. It is necessary to try to prepare. I was swept off my feet by this recipe a few years ago. A guy invited me to his place for an "impromptu" dinner, and this is what he made. It was memorable, to say the least. As usual I love your writing AND the recipe, Melissa. I can only confirm that pasta, cream and smoked salmon can result in a heavenly dish. Thanks for sharing ! Lovely recipe! I’m always blown away by your beautiful writing. Your posts read like fiction. Melissa- Please come visit me. I have something for you. I really love pasta and the sight of this makes me wanna drool… AAAAHHHHHH!!!! i’m hungry!!! Oh how genius to name your "little black dress" recipes! I have many of these too, but what about a guy like Todd? He doesn’t wear dresses, so what could his be called? :)The pasta looks comforting and just divine! I so adore smoked salmon. Recently, I encountered my first case of an adult who actually doesn’t like it, and was, well, gobsmacked, as they say in your present part of the world. For the most part, though, smoked salmon offers a rare combination of sophistication and (nearly) universal appeal which fits right in with your "little black dress" comparison.This looks delicious! I made this twice so far. The first time it came out awful, but the second time it was great! Really easy recipe! Here are a few points to note:1) Don’t use sweet vermouth, it gives a sickly sweet flavor to the final dish that ruins it.2) Don’t over-do the sugar for the same reason.3) In my experience, it survives refrigeration quite well. In fact, I liked it microwaved more than fresh! !4) This dish seems like it could sustain some heat (the spicy kind), but I haven’t tried yet. I’m thinking of adding some sort of powered chili pepper to the sauce. Hi guys, thanks so much for your comments, and I’m delighted to have your feedback on the recipe! Isn’t it funny how often it’s the simplest things that leave the biggest impression?And Corey, you brought up a good point – what on earth is the male equivalent of the little black dress? Thank YOU Melissa – always a pleasure reading your posts.For Nathan – I’m kind of partial to heat myself, but neither my wife nor princess Ceilidh are. Try garnishing with some fresh Thai peppers and green onions sliced on an extreme bias (long thin rings). Want more heat, add more garnish.The closest thing I’ve been able to think of to an "LBD" for a guy is olive chinos, button down collared shirt and a navy blazer. I know there have got to be some of your readers that can do better than that. I’m going to stay with my new man this weekend, and as I packed the casual weekend equivalent of my LBD I realised I should probably have culinary equivalent as well, in case I’m called upon to show off my potential wifely attributes in the kitchen… Tested this recipe out on my flatmate this evening and he confirms that no man could fail to be impressed! I think I would reduce the amount of sugar as my tomato paste is quite sweet, and add the tiniest dash of cayenne, as a previous poster mentioned. The lemon thyme is an inspired garnish. Delicious – thank you! Made this for dinner tonight. So easy. So good. Melissa,We had a birthday dinner to prepare the other night and some smoked salmon to use so thought we’d try your recipe. We actually DOUBLED the recipe, wanting to be sure to have enough – of course we ended up with what we thought would be way more than enough. Melissa, we’re far from pros at cooking, but this recipe was such a hit! The word delicious does not do it justice – and by the time people finished with second, and yes, third helpings – well, there wasn’t much left after all! Thank you for this easy to prepare delight! This sounds fabulous – I’d like to see about making it in a ‘backpackable’ version, which probably means no cream or cream cheese. Anyone have any ideas? Hi Essey – I made that joke because in traditional Italian cuisine it’s very rare to find fish and cheese paired together, particularly in pasta. I’m not sure what the rationale is, though I’ve heard it’s because Italians believe the strong flavor of hard cheeses can easily overwhelm the delicate flavor of seafood. Of course if the seafood itself has a strong flavor (like here), the restriction doesn’t make a lot of sense, so my advice is to just trust your tastebuds! This really is a great recipe, it has become one of my standards for occasions on which I either want to impress someone else or pamper myself. It’s just so, so good.If you DO happen to have leftovers, however, I would like to add that it makes for a great spread as well – you can just spread it on toast and enjoy it without reheating. I tried a version of this recipe with ricotta–it worked very very well, also a few chopped capers on top really makes this zing! Hey there Melissa!I came across your fabulous blog, while looking for that "extra somethingl" salmon pasta recipe for my man's Bday dinner 🙂 Am definitely trying this today -with a view to actually serving it on the day (29th).Was wondering if you wouldn't mind giving me a couple of ideas re: the rest of the menu. Was planning to have little chocolate shuffles with vanilla ice-cream for dessert -would that be ok (combination-wise)? Also, what kind of salad and wine do you think would compliment this best?Thanks in advance for all your time and help! I was looking for some delicious recipes with salmon and I think I founded the right one here. My first and only salmon recipe was Salmon Quiche which was not so hard to make. This also doesn't look hard to make. Joanne don't give up!